UPDATED: Wed., Feb. 6, 2019, 7:27 p.m.
Aaron Best’s gray dress suit was the second-most impressive thing the Eastern Washington coach showed off on Wednesday. Best and his coaching staff – through a series of high school highlight videos – displayed their 2019 recruiting class to a room full of red-clad fans at Northern Quest Resort and Casino. On National Signing Day, the Eagles inked 10 scholarship players and announced the addition of six preferred walk-ons. 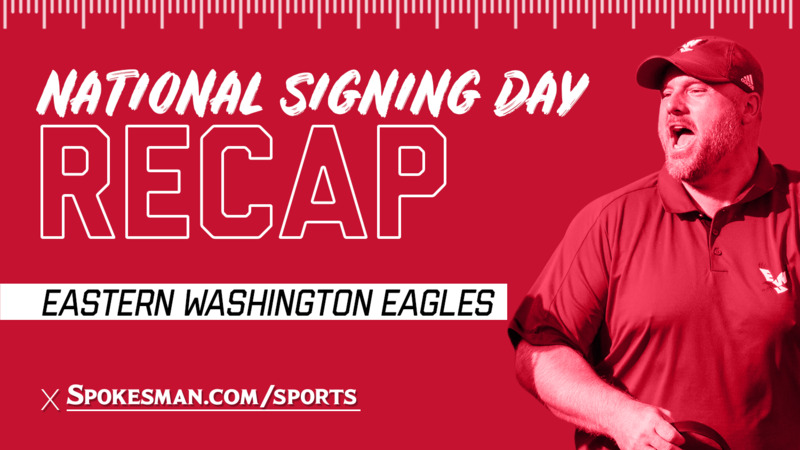 EWU, which lost 27 seniors from last season’s FCS national runner-up team, signed nine players last month during the NCAA’s early signing period, bringing the total number of newcomers to 25. The second recruiting class of the Best regime is talented, long and versatile, he said, with one particular need. “Cornerback was a need that was addressed most in this recruiting class,” said Best, last season’s Big Sky Conference Coach of the Year. The Eagles, who broke up 70 passes last season and had 22 interceptions, lost starting corners Josh Lewis, D’Londo Tucker and Nzuzi Webster to graduation. EWU also recently lost eight-year cornerbacks coach Cherokee Valeria, who accepted a secondary coach position at Sacramento State. EWU looks to its next crop of ball hawks, which includes of pair of three-star recruits in cornerbacks Marlon Jones and Trey Edwards. Jones, a 6-foot, 175-pound corner out of Tacoma’s Curtis High, was an All-Puget Sound defensive back, receiver and kick returner and one of the fastest athletes in the state. He clocked in at 21.99 seconds in the 200-meter and 11.09 in the 100 for Curtis’ track team. Edwards, one of EWU’s nine new California recruits, was a physical, 6-foot corner for Narbonne High School in the Los Angeles area, totaling 25 tackles, an interception and seven passes broken up last season, helping his team win a CIF Los Angeles City Section Championship. The Eagles’ recruiting class includes one transfer in outside linebacker Ty Graham, a starter at Idaho in 2018 after starring at Cheney High. Graham, who played as a true freshman in 2016, will likely redshirt at EWU this fall because of NCAA transfer rules. “Transfer rules, they’ll play themselves out, but in our minds (Graham) will redshirt and return for his senior year in 2020,” said Best, who pointed to the Eagles’ current depth at linebacker. Best said one incoming freshman who has the potential to turn heads immediately is running back Kyle Bryant, a versatile, 6-foot, 185-pound speedster out of San Fernando (California) High School. Jaeger Hoffman, the son of University of Washington great Dave Hoffman, comes to EWU after starring at Moorpark (California) High. The 6-3, 205-pound linebacker was a three-time all-conference selection Best expects to play defensive end. On the offensive front, 6-7, 315-pound Matthew Hewa Baddege (Port Coquitlam, British Columbia) chose EWU over an offer from FBS Kent State, according to 247sports.com. Locally, EWU welcomes a pair of preferred walk-ons in Northwest Christian star running back Silas Perreiah and Colville defensive tackle Jacob Newsom. Perreiah rushed for 5,602 yards and 72 touchdowns. Newsom was a first-team all-state selection for Colville, which won a State 1A title last fall. Best said Perreiah and Newsom have the potential to have great careers at EWU, like many former EWU walk-ons, including All-American quarterback Gage Gubrud. “Three of our five captains last year were either walk-ons or partial scholarship kids,” Best said. Published: Feb. 6, 2019, 7:04 p.m. Updated: Feb. 6, 2019, 7:27 p.m.